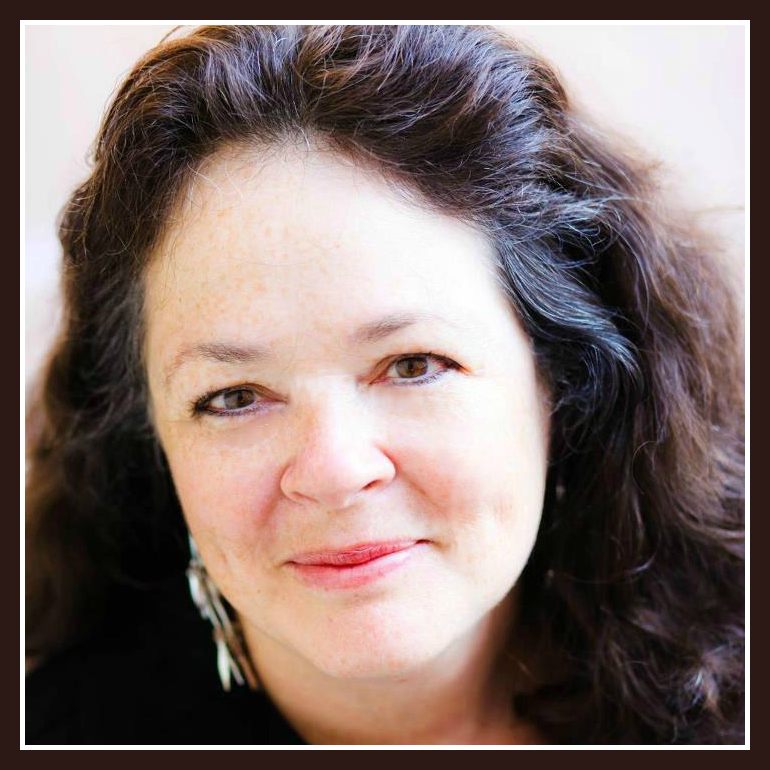 Heroes, Heroines, and History: The Loveliest Castle in the World and Giveaway! The Loveliest Castle in the World and Giveaway! Hi, this is Janalyn. Today I'm announcing a giveaway, so be sure to read to the bottom of the post. While writing DawnSinger, book one in my epic fantasy trilogy, Tales of Faeraven, I dreamed up a castle that would feature in my book. Imagine my surprise when I came across pictures of Leeds Castle that resembled the stronghold of my imaginings. After learning that Leeds was described by historian, Lord Conway, as the loveliest castle in the world, it all makes sense. Being an admitted nut about the middle ages, I am obviously in tune with castle amenities. Leeds must have been really something back in the day, if such a noteworthy castle expert took, well, note. It's aged well, as the following image will attest. Leeds Castle was first built as a stone structure after the Norman Conquest in 1119. It transferred to the British Crown in 1278. In 1552 a succession of wealthy families took ownership until the castle was donated in 1974 to the Leeds Castle Foundation, a charitable trust set up to maintain it as a 'living castle,' which it remains today. Leeds Castle and its idyllic 500-acre setting are open to the public. Leeds is located in the heart of the Kent countryside in a picturesque valley of the River Len. 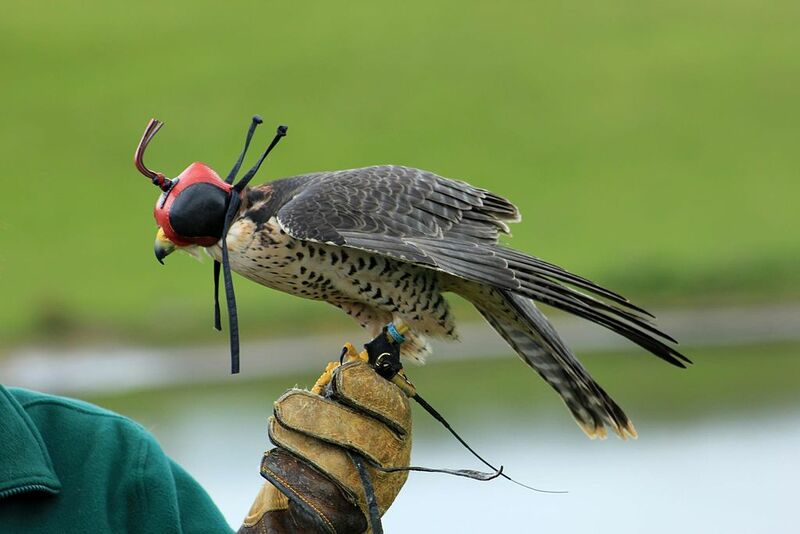 Visitors enjoy a variety of activities, from falconry to hot air balloon rides. I'm ready to pack my bags! How about you? But wait, it gets better. 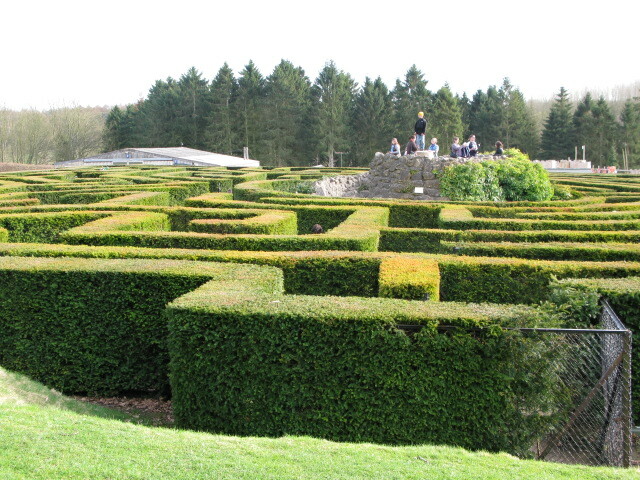 The visitor who persists to the center of this maze, built with 2,400 yew trees about twenty-four years ago, is rewarded with a panoramic view. Staff members positioned above the maze help guide the lost. I can imagine they have a few stories to tell. Part of the maze represents a queen's crown. The pattern is actually square, but appears circular when seen from the center or the air. The diligent are rewarded when they reach the central mound because they can then exit through a secret underground grotto. 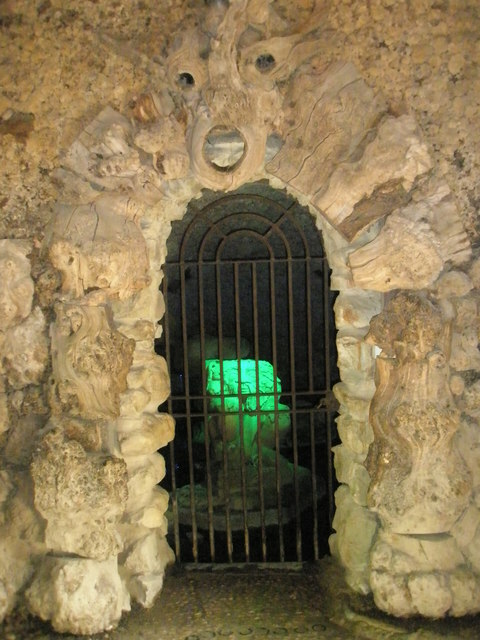 The grotto features mythical creatures, benches, and other forms crafted from shells, minerals, and wood. Erm, I'm not sure I want to go through that gate. 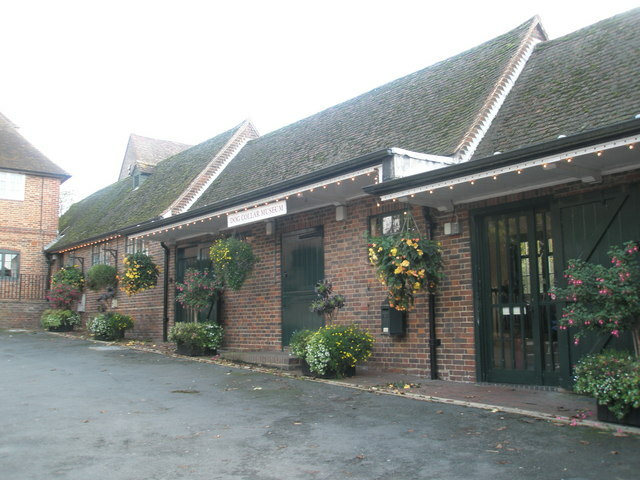 Those who enjoy historical trivia will find the Dog Collar Museum, with its large collection from five centuries of pooches, fascinating.The museum contains over 130 rare collars, with the earliest dating to late in the 15th century. That one is a Spanish iron herd mastiff's collar, meant to provide protection from bears and wolves. The collection includes a 16th-century spiked German collar made of iron and also some elaborate gilded ones from the Baroque era. There are also collars made of silver from the 19th century and some more modern ones made from tires. The museum started when, in 1977, Mrs. Gertrude Hunt donated her collection of more than 60 collars from all over Europe, dating between the 16th through the 19th century. She made this contribution to the Leeds Castle Foundation in memory of her husband, John Hunt, who had been a historian. 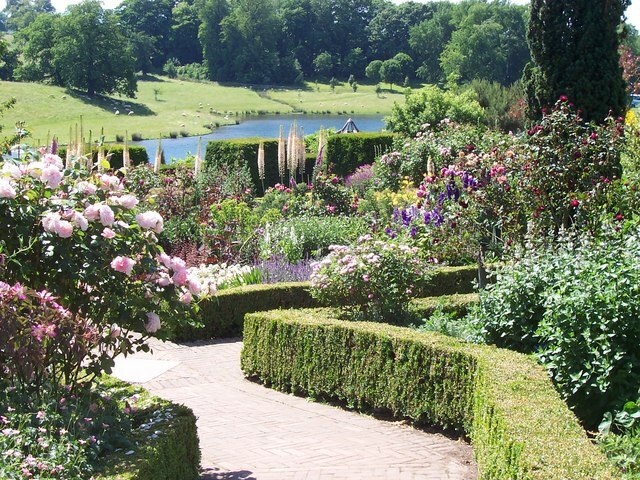 Box hedges bordering lovely, scented flower beds in a gorgeous English garden that offers opportunities for holding hands with your sweetheart. Leeds has three main gardens: the wood garden alongside the River Len, the Culpepper garden, a cottage garden named for the family who owned the castle in the 17th century. and the Lady Baille Mediterranean Garden Terrace. A punt is a flat-bottomed wooden boat that is propelled by your guide by means of a pole that reaches to the bottom of the moat. Punting on the moat allows visitors close-up views of parts of the castle not visible any other way. 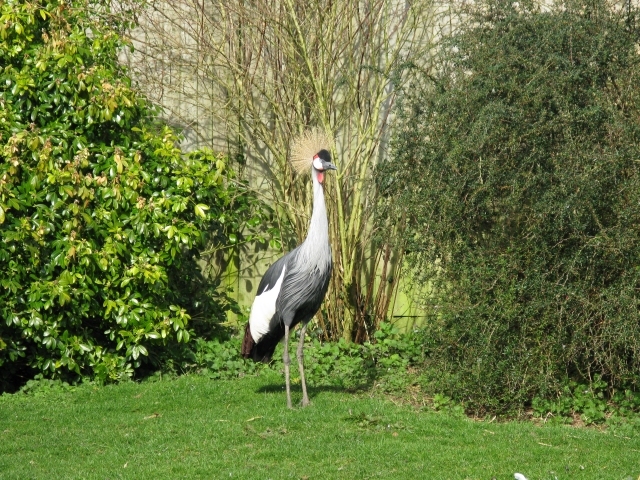 Over 100 species of rare and beautiful birds inhabit the outdoor aviary.What's not to love about that? The Bird of Prey Center houses a variety of predatory birds. Flying demonstrations take place daily. The nearly 1,000-year-old building is a treasure trove of antiques and a place redolent of history. Leeds Castle, as home to queens and kings of England for nearly three centuries, garnered its share of romantic and political intrigue. Not dissimilarly, Shae, the heroine of DawnSinger, enters a confusing world when she journeys to Torindan, where all is not as it seems. 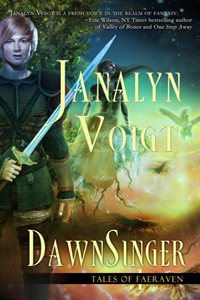 For the chance to win one of three Kindle or PDF copies of DawnSinger, enter before midnight tonight using the secure link, below. Oh my stars, I want to do it all! I'd love to visit all of the European castles in my lifetime, but unless I win the lottery (do you have to play it to win?) that's not likely. I guess I'll just have to go in my dreams! Me, too, Candy! We share the same ambition to visit European castles. Maybe just save for a visit to one? Meanwhile, dreaming is fun. I have to agree with Candy. Leeds Castle would be an awesome place to visit and explore. Thanks for the info and fabulous pictures! What a beautiful place! I'd love to go there someday. Thank for telling us about it. Thank you for this info on Leeds Castle. Just beautiful! I feel your enthusiasm in researching this piece. Perhaps some day soon you'll be able to explore one. Hubby and I visited castles in UK, but not this one. I enjoyed the magnificent structures,learning the history on each one, walking through the splendid gardens and seeing the exhibitions on the grounds. My young sons were more interested in seeing the weaponry on display and explore the dungeon. Hi, Pat. A castle tour is a trip my husband and I are planning at some point. There are a lot of them in Ireland, where I'm setting a book. Weaponry and dungeons would definitely interest my husband, whereas gardens, history, and architecture are a bigger draw for me. I loved the virtual tour of Leeds Castle. The photo are amazing! I've visited Glen Eyrie Castle in Colorado Springs, CO. It's beautiful.